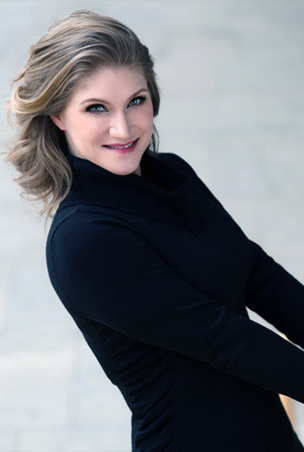 Jane Archibald began her career in her native Canada, before becoming an Adler Fellow with the San Francisco Opera. She then joined the ensemble of the Vienna State Opera, debuting many coloratura roles. She has since gone on to perform regularly in the celebrated opera houses and concert halls of the world. Her 2018-2019 season includes performances with Sir Simon Rattle at the Royal Albert Hall/BBC Proms and at the Lucerne Festival, role debuts as Mathilde (William Tell) at the Theater an der Wien and Daphne (Daphne) for Frankfurt Opera, concerts of Candide in London and Tel Aviv, Bach’s St. Matthew Passion in Lyon, Britten’s Les Illuminations in Portland and concerts at home in Halifax with the Camerata Singers (Annelies) and Symphony Nova Scotia (Mozart’s C Minor Mass). Her career thus far has taken her to the Metropolitan Opera, Bavarian State Opera, Paris Opera, La Scala Milan, Teatro San Carlo, Carnegie Hall, Barbican London, Royal Opera Covent Garden, Zurich Opera, Deutsche Oper Berlin, Berlin Philharmonic, Royal Concertgebouw Orchestra, Canadian Opera Company, major orchestras in Atlanta, San Francisco, Seattle, Toronto, Madrid, Hamburg, Cincinnati, Salzburg and opera houses and festivals in Lyon,, Geneva, Hyogo, Copenhagen, Toulouse, Baden-Baden, Aix-en-Provence and Santa Fe, among others. Jane lives in Halifax, NS, with her husband, tenor Kurt Streit, and their family. Archibald shows off a spectacular instrument and gorgeous technique in eight arias and one recitative from five operas… This is a treat from beginning to end. With powerful coloratura pipes, Archibald melts the reactor core this scenes from L’anima del filosofo, ossia Orfeo ded Euridice (1791) and Orlando Paladino (1782). …the coloratura of soprano Jane Archibald as Zerbinetta, who stopped the show with her brilliant vocal pyrotechnics. Together they represented what this opera is all about: the contrast between deep and profound art, and light, delightful entertainment.